The new 2019 Toyota GR Supra has now been officially revealed. But of course you want to know more about its design, technology and performance. 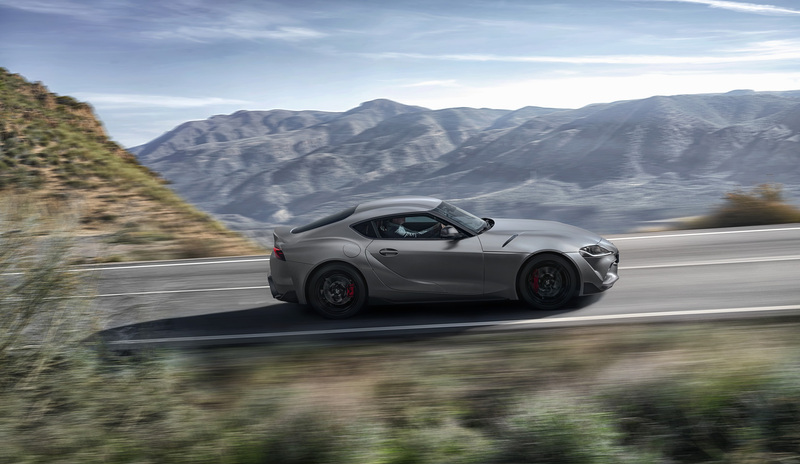 Is it the sports car that Toyota enthusiasts were hoping for? This post reveals more information about these fundamental areas of development. 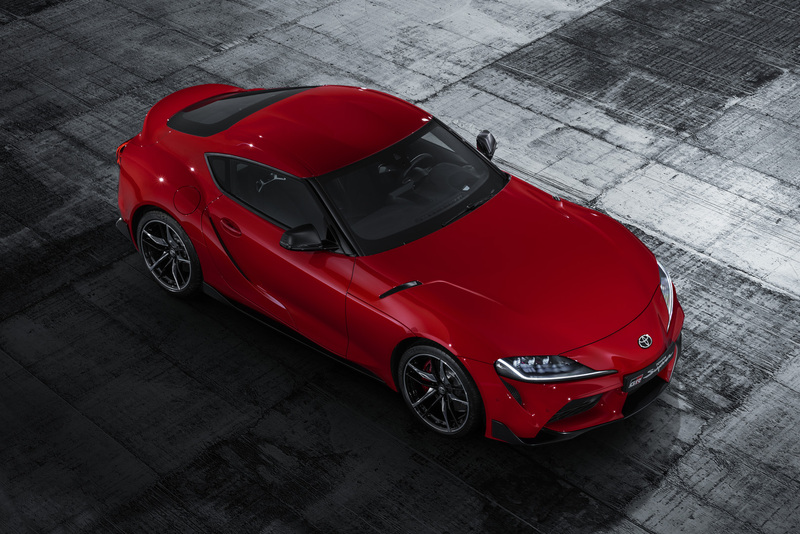 Even at first glance, it’s clear to see how Toyota’s sports car heritage is referenced in the design of the new Toyota GR Supra. 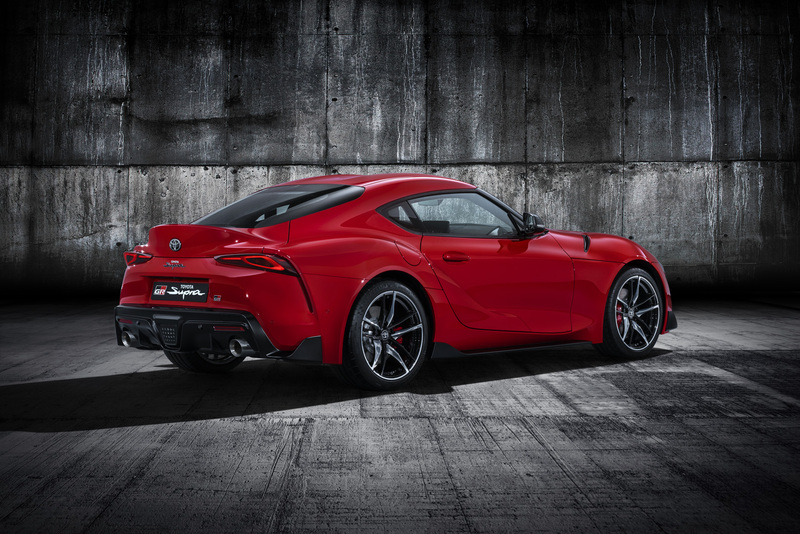 The landmark 2000GT’s influence is evident in the long bonnet, compact body and double-bubble roof, while the distinctive look of the fourth-generation Supra is captured in the muscular rear wings and arc of the integrated spoiler. 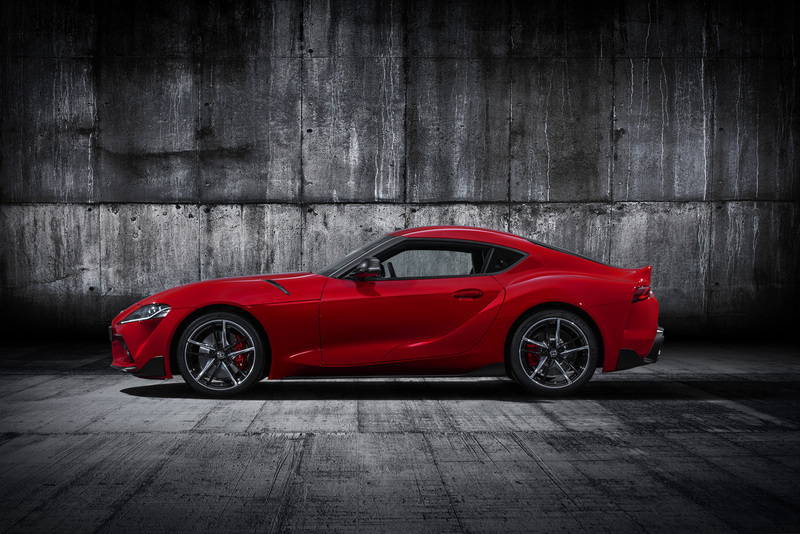 The resemblance is more than skin-deep, though, as the new Toyota GR Supra shares the same classic sports car format of a powerful front-mounted six-cylinder engine and rear-wheel drive as its celebrated predecessors. The design theme was first previewed by Toyota in the dramatic FT-1 concept car, styled by its Calty studio in California and revealed at the 2014 North American International Auto Show in Detroit. Chief designer Nobuo Nakamura gave his team a simple brief around the concept of Condensed Extreme, purposely avoiding any emotive words so they were free to express their vision of a pure and individual sports car in a truly original design. Condensed Extreme refers directly to the vehicle’s packaging, comprising three principal elements: a short wheelbase, large wheels and wide stance; a taut, two-seat cabin; and a long bonnet with a compact body that reflects the drivetrain combination of in-line six-cylinder engine and rear-wheel drive. Nakamura envisioned a car that is indisputably modern in design, yet evokes the romance of classic sports car styling. The result approached the limits of what could be manufactured in higher volume, in particular the powerful curves of the rear wings. In the finished design, the Condensed theme is evident in the relationship between the Toyota GR Supra’s large-diameter wheels, short wheelbase and overall length. It’s notable that the wheelbase is in fact shorter than in the Toyota GT86 coupe, and the tyres are larger. Extreme is interpreted in the car’s wide stance, with tight cabin proportions and a wide track, contributing to a high level of manoeuvrability and stability. The design was precisely calculated to achieve both optimum drag and lift characteristics, and an ideal front/rear weight balance. For example, the double-bubble roof is not simply a heritage-inspired styling feature; it is effective in minimising drag by reducing the car’s frontal area, without sacrificing headroom in the cabin. 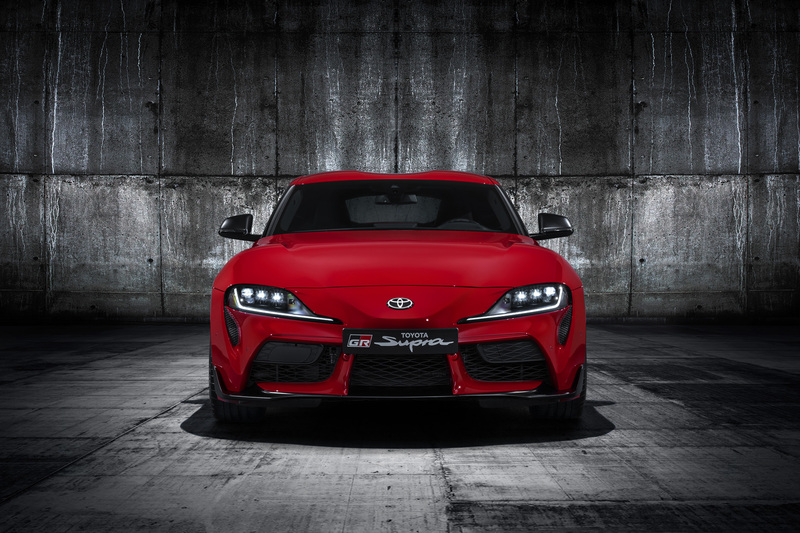 The frontal design was inspired by the fourth-generation Supra but has a more expressive look with a low stance emphasised by a prominent central grille flanked by large air intakes that are essential for engine cooling. The distinctive headlight units have a six-lens LED arrangement incorporating the indicators and daytime running lights. Positioning the lamp units closer towards the nose adds further visual volume and power to the shell-like front wings. In side view, the low bonnet generates a dynamic line that flows rearwards from the car’s low nose, while the back edge of the bonnet and rear spoiler are set at almost the same height, linked by a low belt line. The underbody has a slight forward angle while the cabin has a strong rearward slant, with blacked-out front pillars and character lines on the side of the roof emphasising the taut, compact cabin. Sharp-looking, sturdy sills express the car’s high rigidity. 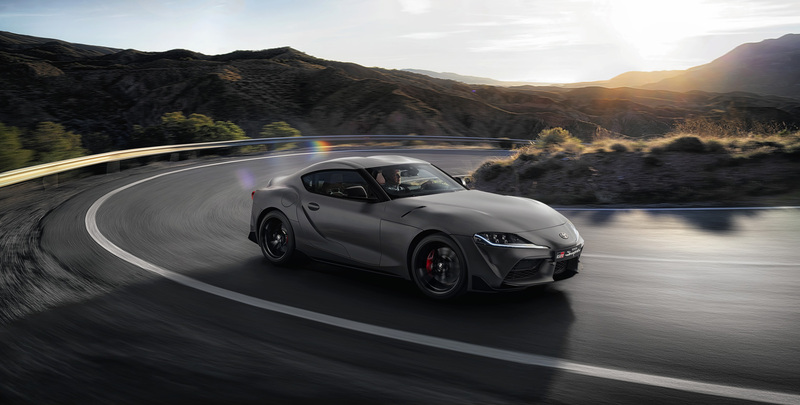 In Europe, the Toyota GR Supra will be fitted as standard with lightweight but highly rigid 19-inch forged alloy wheels with alternating black and polished-finish slim spokes. At the rear, the arching lip spoiler has been optimised to suppress lift, while the bumper’s trapezoidal shape generates a sense of movement down and out towards the tyres. The rear combination lights have a simple internal ring arrangement, while the distinctive rear fog lights and reversing lights are formed by dot-LEDs grouped in the centre of the lower bumper. The evocative styling will be shown to its best effect by a range of eight different colour choices for the paintwork, including strong red, yellow and blue shades. A new Matt Storm Grey finish will be available for a special edition model, adding extra visual drama and a metal-like texture to the car’s curved surfaces. 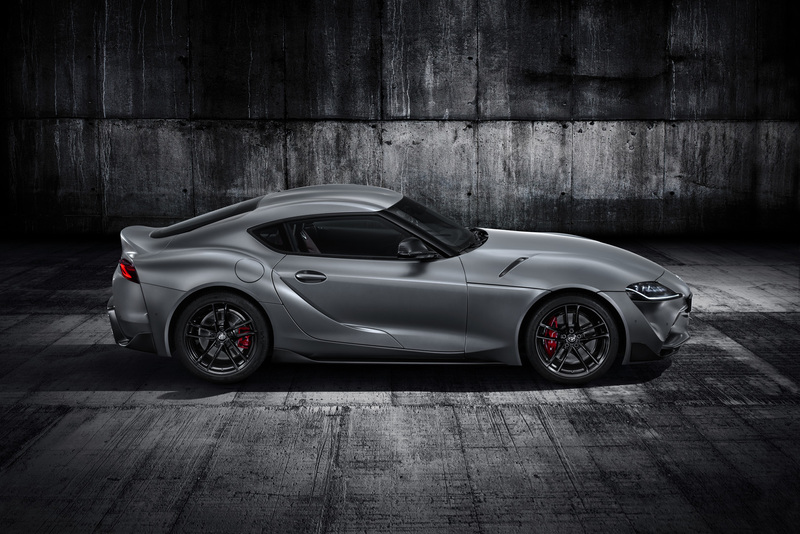 The cockpit in the new Toyota GR Supra neatly combines traditional GT elements with ultra-modern functionality. Designed to help the driver focus entirely on the business of driving, it is directly influenced by the layout found in single-seater race cars. The low, slim horizontal dashboard maximises the forward view through the windscreen, helping the driver place the car with precision in high-speed driving, while the principal controls are tightly grouped for quick and easy operation. The instrument panel, centre console and door trim combine seamlessly to give the cockpit a strong, unified feel. The shape of the cockpit flows into soft, supportive knee pads in the door trim and on the side of the centre console, their shape calculated with the benefit of Toyota Gazoo Racing’s circuit racing experience. The head-up display, meters and paddle shifts all sit directly in front of the driver, with additional switches located on the three-spoke steering wheel. The wheel itself is contoured for excellent grip and is wrapped in leather. The 8.8-inch high-definition driver’s instrument display is clearly visible through the steering wheel, with the 3D-effect tachometer and shift indicator positioned in the centre; a digital speed read-out is to the left and infotainment and navigation information is to the right. An asymmetric centre console marks a clear division between the area enveloping the driver and the more open passenger side of the cabin. Knee pads are provided here, too. The air conditioning control panel sits proud of the console, with memory-touch switches for easy operation, and an 8.8-inch central multimedia display is mounted above the console. This display can be operated as a touch screen, or by using a rotary controller. The boot space is large enough for two people’s luggage for a weekend away and can be extended with a removable panel at the back of the cabin, creating enough space for a golf bag or all the personal kit needed for a track day. 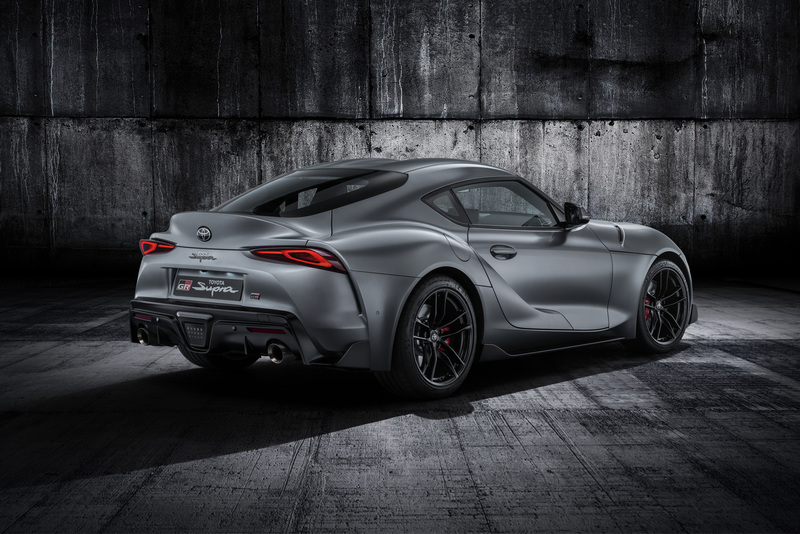 The new Toyota GR Supra’s seats have a racing-influenced design that ensures comfort at all times and excellent support, particularly if the car is being used on-track. Body-holding side bolsters are featured on the cushion and high back, and there is an integrated head restraint. Upholstery options include leather and a combination of leather bolsters with a perforated Alcantara covering for the seat back and cushion that provides a degree of ventilation and additional body-holding performance. 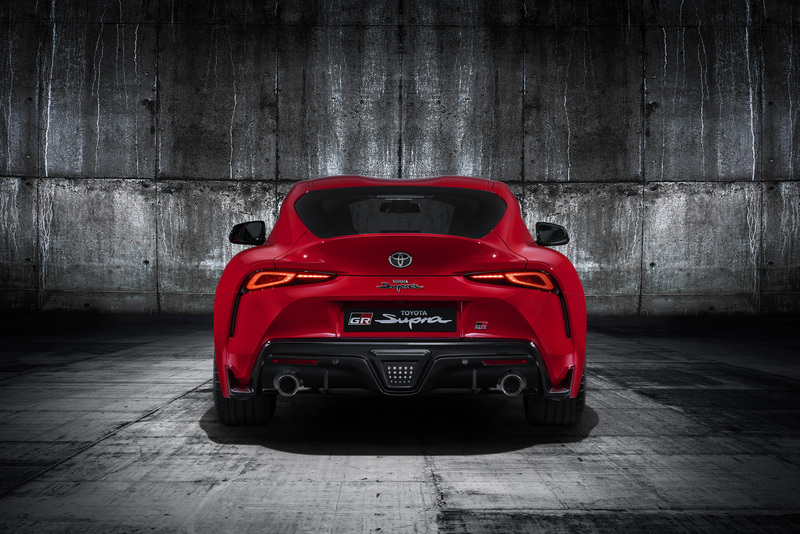 The performance heart of the new Toyota GR Supra is its 3.0-litre in-line six-cylinder engine, producing up to 335bhp and 500Nm torque. It is fitted with a twin-scroll turbocharger, high-precision direct fuel injection and continuously variable valve control that secure segment-leading torque performance from very low revs. The unit is powerful, well-balanced, smooth and light revving, with an exhilarating acceleration feel. It is matched to an eight-speed automatic transmission that provides lightning-fast up and downshifts, with short ratios selected for the lower gears. The driver can take control of gear changes using paddle shifts on the steering wheel, and can select Normal or Sport driving modes to suit their preference and the conditions. Engine sound and response, shift pattern, damping, steering and active differential performance are adjusted when the driver selects Sport mode. A Launch Control function enables powerful acceleration from standstill with maximum traction, helping the car move from rest to 62mph in just 4.3 seconds. The Vehicle Stability Control has a special ‘track’ setting that can be selected, reducing the level of system intervention so the driver has greater control of the vehicle’s dynamic performance. 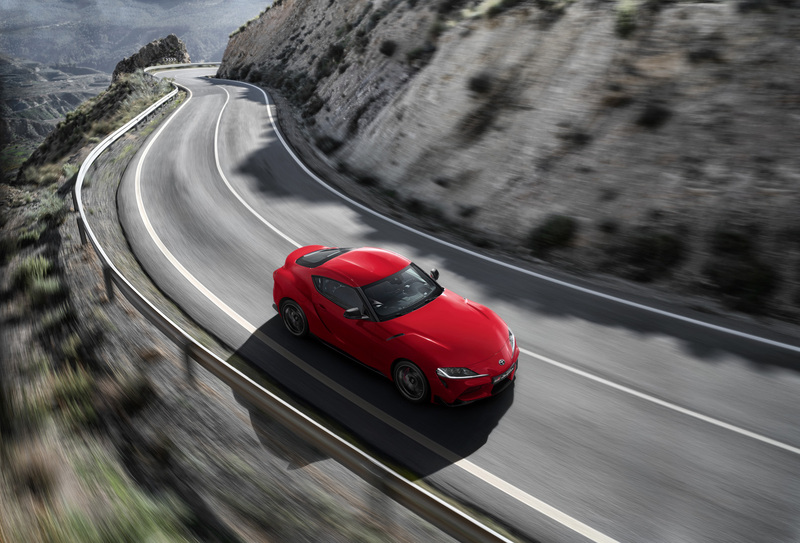 All versions of the Toyota GR Supra sold in the UK and Europe will be fitted with an active differential that operates both when accelerating and decelerating and can seamlessly adjust from zero to full, 100% lock, with instant response. A dedicated ECU monitors a wide range of inputs, including steering wheel, throttle and brake pedal operation, engine speed and yaw rate, for appropriate triggering of the actuator. It delivers huge benefits in stability and efficiency when the tyres are reaching their performance limit. The effect is felt in all phases of cornering, with increased stability during braking and cornering phases and then maximum grip as the driver accelerates out of the bend. A car’s exterior dimensions are the first task to consider when starting with a clean sheet of paper. Where the Toyota GR Supra is concerned, these were defined in order to prioritise the car’s agility and handling. The key calculation is the ratio between the wheelbase length and track width. The best balance of great agility and superior stability is achieved with a ratio of between 1.5 and 1.6. Achieving the 1.55 ‘golden ratio’ was thus the starting point for the Toyota GR Supra development team and the key building block on which everything else was optimised. High targets were set for handling performance, achieved in a development programme led by Toyota Gazoo Racing that included extensive testing on a wide variety of challenging roads worldwide. On-road testing also incorporated track sessions, including the Nürburgring Nordschleife. 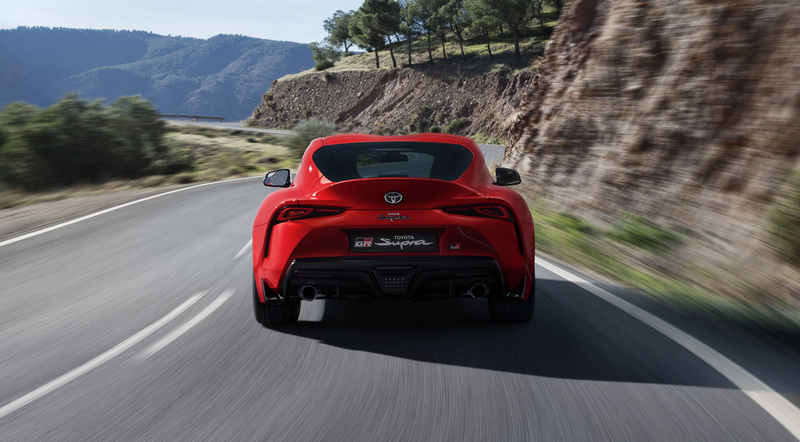 High structural rigidity (greater even than the Lexus LFA supercar), a centre of gravity lower than the GT86 coupe and ideal 50:50 front/rear weight distribution were fundamental to achieving the dynamic goals, but required bold engineering decisions. For example, the desired weight balance was gained by moving the engine as far as possible rearwards, which introduced new production challenges. The high body rigidity allowed for more precise and detailed refinements to the suspension geometry and tuning of the shock absorbers. The new suspension design comprises double-joint spring MacPherson struts at the front and a five-link system at the rear. The front suspension subframe and control arm mounting points have been made extremely rigid to yield precise cornering characteristics, while the use of aluminium for the control arms and swivel bearings reduces the car’s unsprung weight, giving superior agility and efficiency. 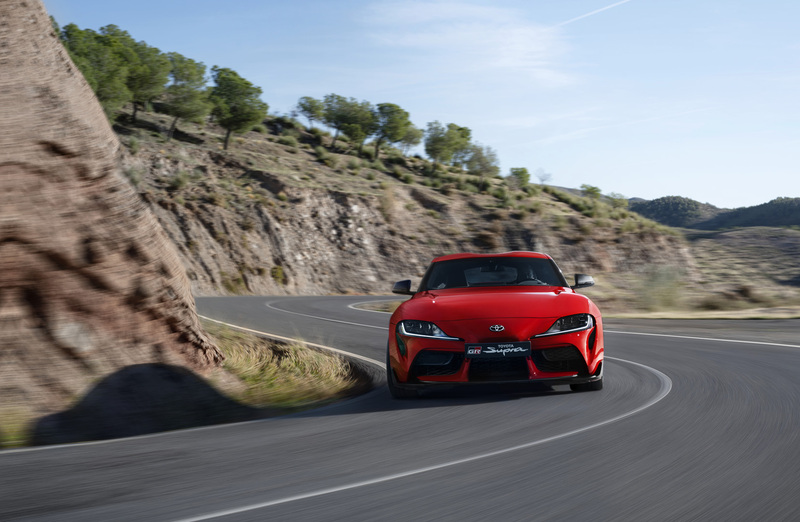 The new Toyota GR Supra also features high-performance hubs with increased camber and optimised kinematics. The electric power steering is sports-tuned and can be adjusted in Comfort and Sport steering modes. The rear suspension benefits from a similarly lightweight design for the rigid subframe and the bracing that connects it to the body, helping ensure extremely precise wheel control. The 19-inch forged alloy wheels are fitted with high-grip Michelin Pilot Super Sport tyres, staggered in size to be slightly wider at the rear. The suitably powerful brakes are fitted with four-pot Brembo calipers. Toyota Gazoo Racing is the umbrella organisation for Toyota’s global motorsports programme and in the past year has won both the 24 Hours of Le Mans in the FIA World Endurance Championship and the manufacturers’ title in the FIA World Rally Championship. Its work is based on three pillars: developing people through participation in motorsport; creating fans through the excitement of motorsport; and applying the knowledge gained from motorsport to make ever-better cars for the road that are fun-to-drive. Starting with the Toyota GR Supra, Toyota Gazoo Racing will transfer the technical learnings it gains from the racetrack or rally stage to the development of not just new generations of Toyota’s sports-focused GR models, but also to its wider range of vehicles, driven by tens of millions of people around the world. New Toyota GR Supra: the legend returns!